Mondays are always painted in ‘blue’ no matter what you wear or what color you see throughout the day. Can’t talk about others but in my case after spicy ‘red’ hot weekends Mondays has to be ‘blue’ only. No, I’m not starting any painting business or color therapy or anything related to that. I’m just little ‘over the edge’ after a sizzling weekend. This weekend was all about my favorite food & drinks which I’ll be sharing this week (hopefully I’ll be able to keep them ready on time for you all). 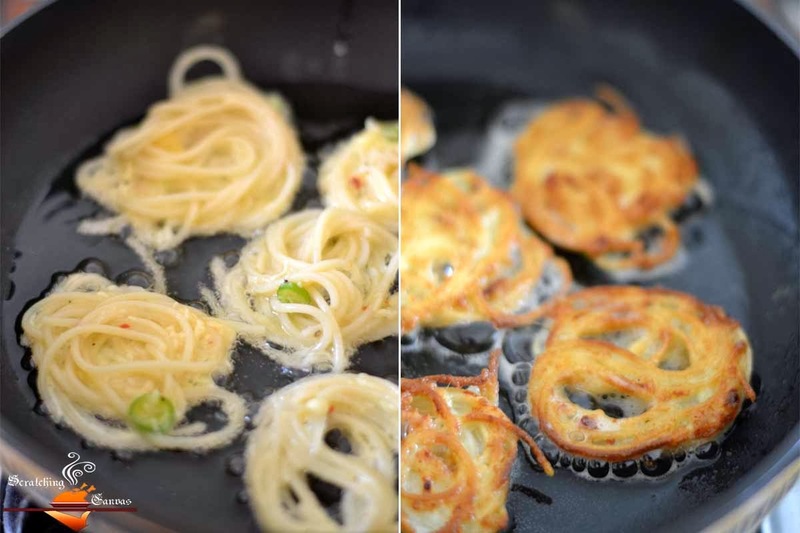 Today’s post is Spaghetti Fritters aka Frittelle Di Spaghetti. Don’t go with the fancy name (or you can always impress the guests with the fancy ones, Lol). It is nothing but fried precooked noodles shaped in patties. Noodles/spaghetti is my all-time favorite item. I love them in any shape or form. During my childhood we used to have noodles in dinner twice a week (read, I used to force my mom to have it) and on the next day (mostly on Fridays) we had another round of my mom’s special Spaghetti Fritters with our evening tea. Not to mention it has always been one of my favorite snacks till date. 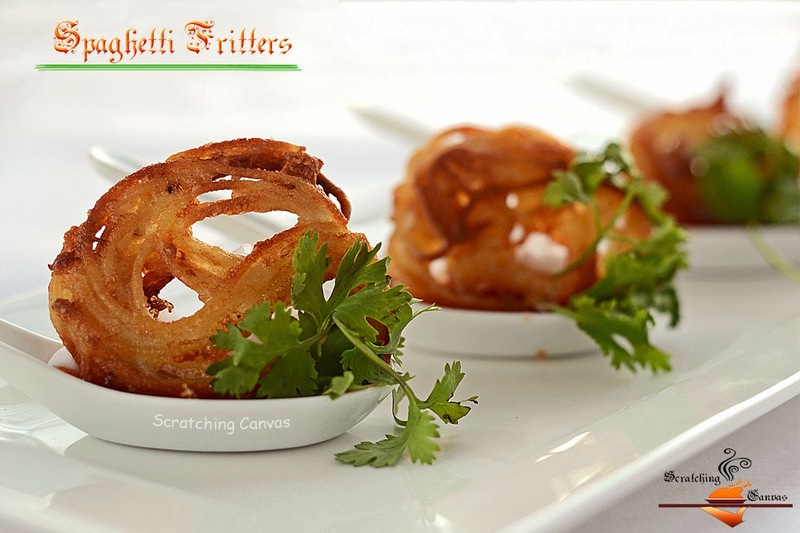 Here is the recipe of Spaghetti Fritters aka Frittelle Di Spaghetti. In the large saucepan boil water with heavy dose of salt. 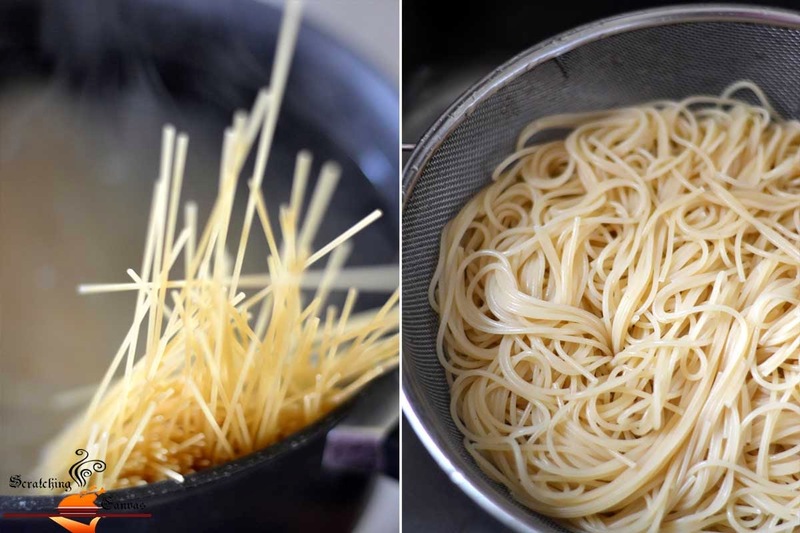 Cook the spaghetti al dente. Drain and keep under running cold water to avoid over cooking. Drain and pat it dry. 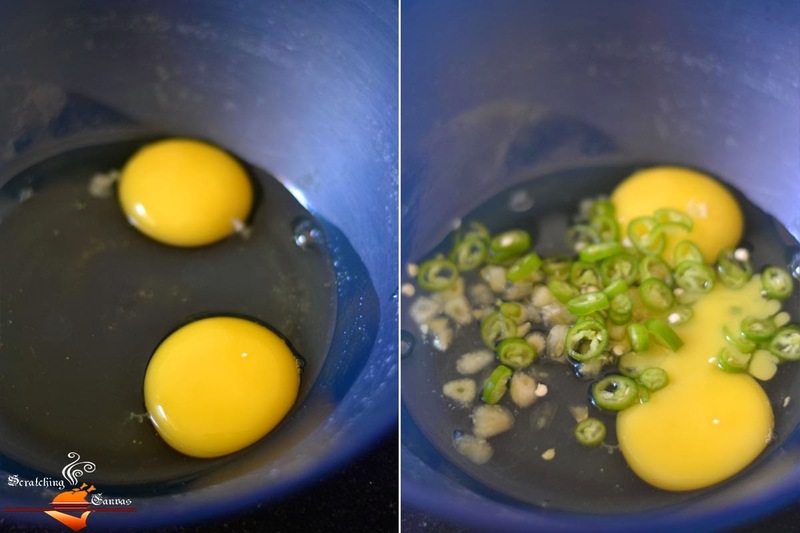 In a large mixing bowl beat eggs with garlic and chili (if using any). 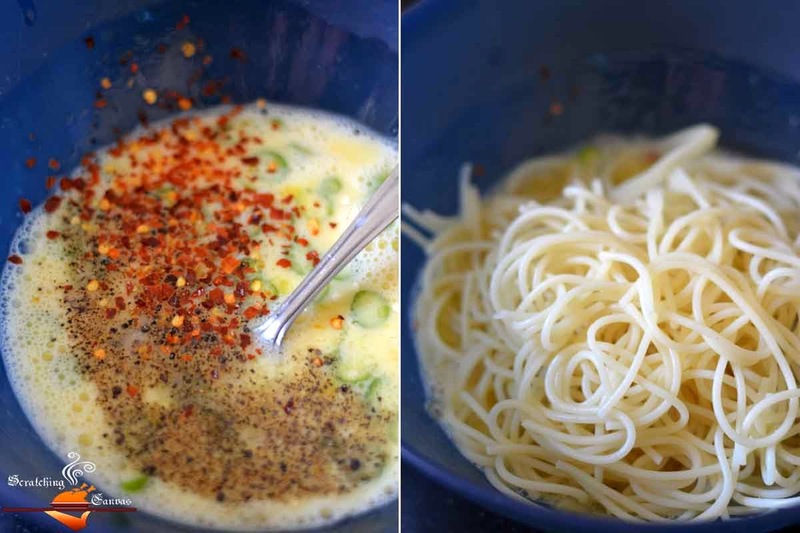 Sprinkle pepper and chili flakes in the mixture. Dump the precooked spaghetti, grated veggies (if using any) & parsley in the mixture and mix well. 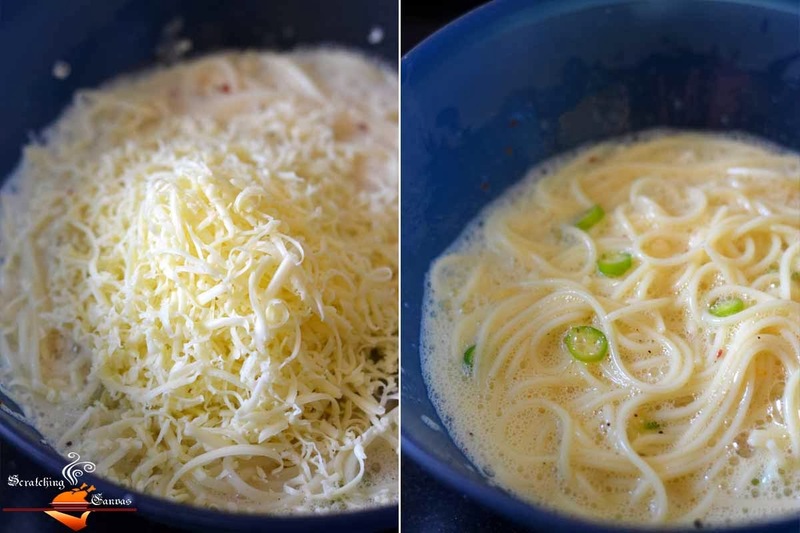 Add the cheese and adjust the seasoning according to your taste. Heat 2 tbsp of oil in frying pan. Take 1 ladle full of spaghetti mixture at a time and add into the hot pan. Repeat until your pan is full. Once the fritters look crispy and nicely brown in color turn them and cook for 1-2 mins or until both sides colored nicely. Don’t overcrowd the pan otherwise it will become messy. 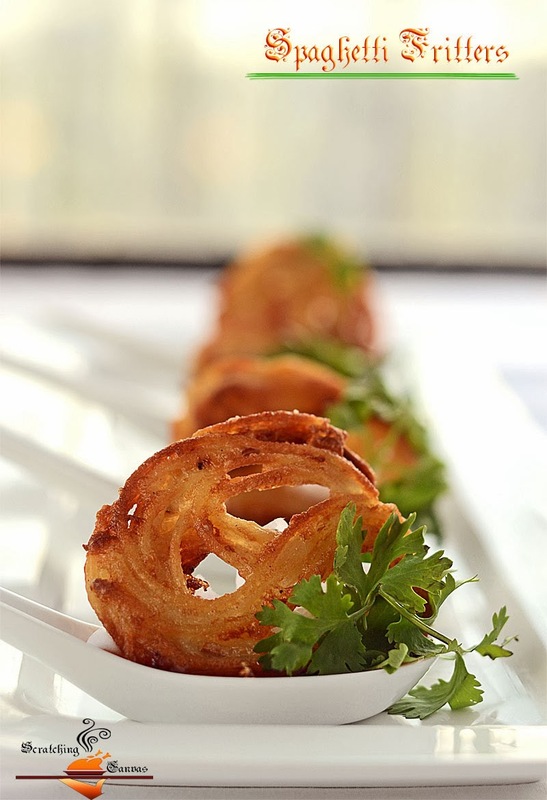 Once done remove fritters from oil and keep on paper towel to get rid of excess oil. repeat until mixture is finished. 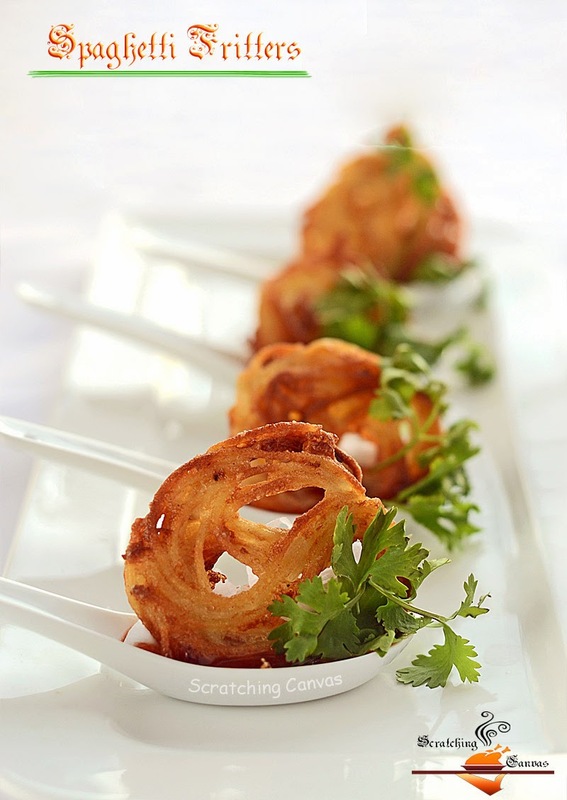 Sprinkle some additional parmesan cheese and chopped fresh parsley on top and serve. 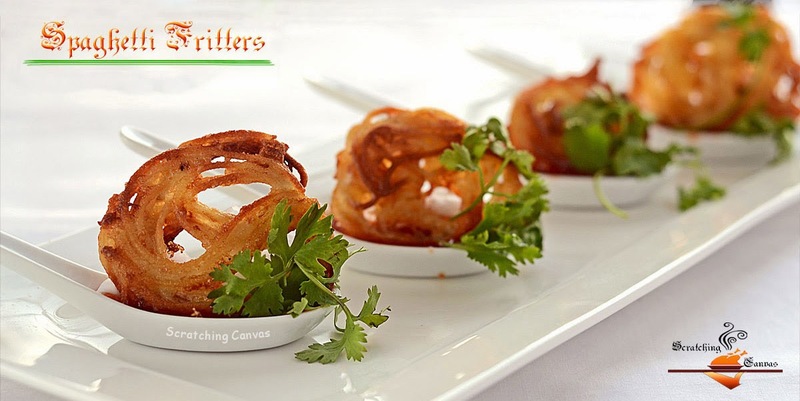 Spaghetti Fritters should be served hot always as fritters will lose the crispiness when cold. You can either serve with ketchup or tea. Even they taste equally good with a bowl of piping hot soup like Chicken Manchow Soup on a cold winter evening . very interesting fritters with spaghetti 🙂 looks fabulous !! Mind. BLOWN. I never would have dreamed this up in my wildest dreams, so I just had to click over from Foodgawker 😉 thank you for sharing, I'll have to keep this in mind for the next too-big batch of spaghetti!